I live by the sea, I see it everyday from my window at work, my kids snorkel and play in it all year round, I row on it in a whaleboat twice a week….it is part of me. So I couldn’t wait for this fortnights NAUTICAL theme at Fashionable Stamping Challenges!!! This is my new most favourite card! The colours are incredible and I hope it shows through ok.
“Perfect Splatter Distress Technique” (Day 9). Love it!!!! I used every colour that I had that would create the effect of being underwater. The other major technique in this card is masking…all the stamps are masked and stamped with black Stayzon Ink on acetate. It only took one go too!!! And the bubbles are done with bleach – because nothing else I tried seemed to work! 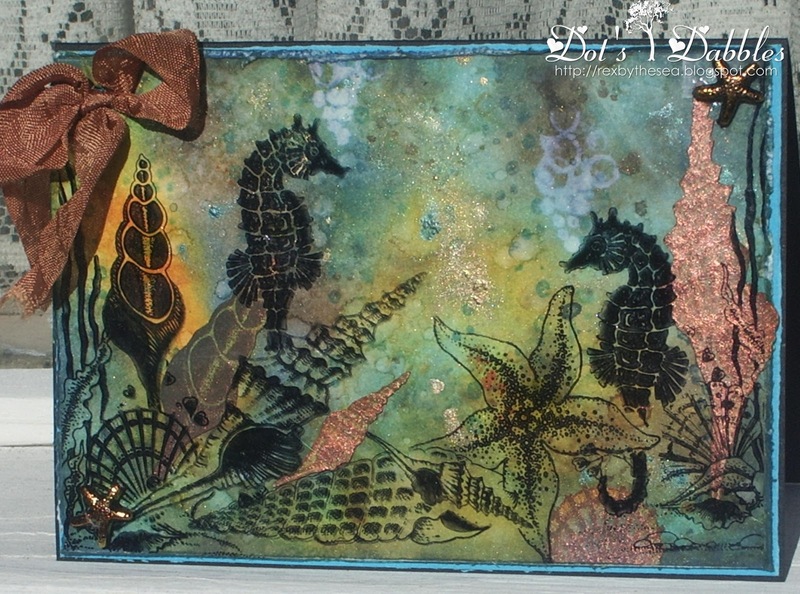 The gorgeous shell and seahorse stamps are from Chocolate Baroque. So remember to pop on over and check out the awesomeness of the Fashionettes and remember to leave some looove. And keep in mind that Marina at Cottage Crafts is generously giving away an on-line gift voucher each fortnight! – Pollycraft Monday Challenge ~ Water, Water, Everywhere! And what a garden indeed! Love all these little sea creatures and shells. Goodness there are even little bubbles and love the touches of gold! I also sea a starfish! How cool to live near the ocean! Fabulously cool! How wonderful! The seahorses and shells are stunning against the gorgeous background. Wow, wow, wow Dot this is one stunning creation, I can see why you are so pleased with it. The colours, details, techniques and composition make it perfect to me. I hope you have a lovely chocolatey Easter Sunday. Fab card – so much detail. Thanks for taking part at LIIU. Can see why you love this one,its gorgeous.It fills the imagination for your under-sea garden. Your creation is just stunning, love the seahorses and your background is wonderful – I am not surprised you like it too! Dot this is amazing, fabulous background and stamping to create a wonderful scene, no wonder you love it. Wow, this is breathtaking….I'm so jealous on you living close at the sea….thanks for joining the Divas….hope to see you next week again! Well I love that detail of the bubbles because it brings such a sense of the underwater and the stamping on acetate – perfection! OH MY GOODNESS! this is chalk full of distressing goodness! I adore your nautical feel! Great job and thanks for joining us at LIIU this month! Wow, an amazing creation! Thanks fro joining us at Divas! Wow Dot! This really is the most amazing creation and can see why you love it (no way could I part with this either!). The background is stunning and the over stamping is just gorgeous. Your underwater garden is wonderful, great details. Love the background. Oh wow, this is amazing! You do the most fantastic creations with your ink Dot, and the colours show through beautifully. Your designs are always so amazing – and this is no exception – wow such fabulous stamping -beautiful scene. Always loved that song! Must be living by the sea that does it! Great take on the theme. Thanks for joining us a LIIU this month for our Distressing Challenge! I'm going to be singing that all day now! lol. Thanks for joining in with us at Happy Daze and good luck! Gorgeous scene you have created and the distressing is just great. Thanks for joining us at LIIU.